I’m sitting here with a puppy sprawled across my chest and under my arm as I attempt to write this post. Rascal says he had a tough day, starting out with me taking him on an hour long walk this morning in the rain. In my defense, it was more of a sprinkle mixed with a light mist. And I can’t feel too bad for him since he insists on walking through the center of every puddle, which doesn’t just make his paws wet but also his underbelly. 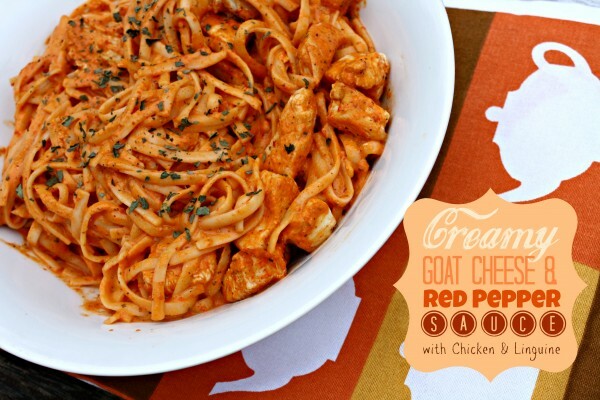 Rascal wants me to tell you that I then tortured him by “making” him watch me cook this dish, without even sharing a taste — Creamy Goat Cheese and Red Pepper Sauce with Chicken and Linguini. I started the recipe early this morning, even before our walk, because my mom and dad were coming over for dinner and I didn’t think I would have the time or energy to prepare something after work. Rascal followed me around the kitchen, as usual, giving me sad puppy dog eyes and waiting for me to drop a morsel. The rest of Rascal’s day was spent curled up in his new bed Santa brought him for Christmas as he patiently waited for me to come home. He said it was torture waiting on me, until I arrived and he greeted me at the door, doing his usual I’m so happy to see you side-to-side wiggle hop. Rascal absolutely adores my parents and was beside himself when they arrived. After making his presence known all throughout dinner and licking our plates clean once we were done, he parked himself on my mom’s lap for the rest of the evening, until my parents left. Usually this involves Rascal sitting at the door and crying for up to an hour. It’s really quite pitiful. I’ve found that the only thing that will soothe his poor wounded heart is a cookie. Cookies are whatever happens to be in his treat jar and seem to be the answer to all of Rascal’s problems. 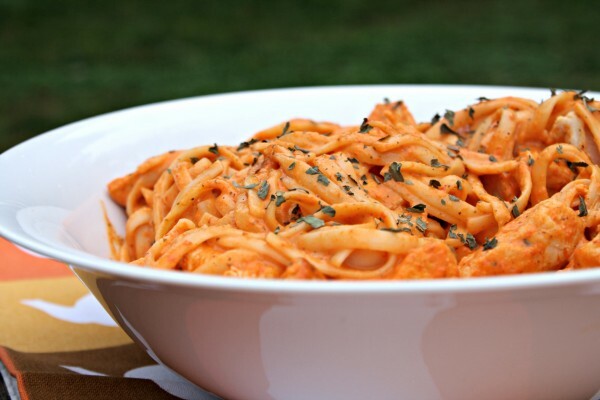 Meanwhile, this easy-to-make and decadent-tasting pasta dish is the answer to your dinner problems, whatever they may be. 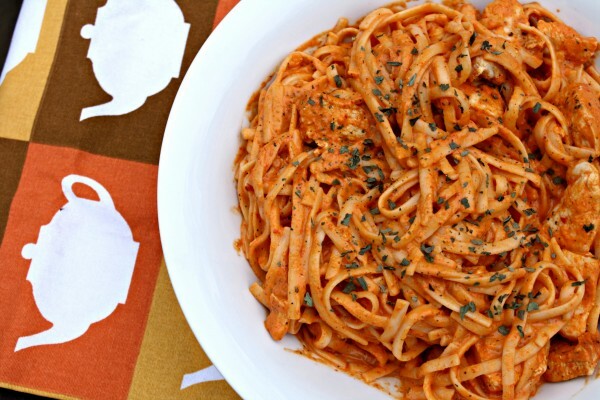 Greek yogurt and a blender make this sauce easy and deceptively decadent. 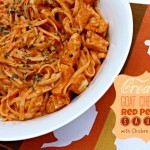 The rich taste of roasted red pepper is a unique take on pasta sauce that your dinner guests will find delicious. Slice red bell pepper into large slices, place on a baking sheet, and broil on 500 degrees until edges begin to turn black. Remove pan from oven, flip peppers over, and continue to broil until the edges begin to blacken. Remove from pan and place into a blender. Also add goat cheese, yogurt, garlic, basil, and salt to the blender and blend until the sauce reaches a smooth consistency. Cut chicken breast into bite size pieces. Warm olive oil in a pan or skillet on medium heat. Add chicken to pan and sprinkle with 1/2 teaspoon of salt and 1/2 teaspoon of pepper. 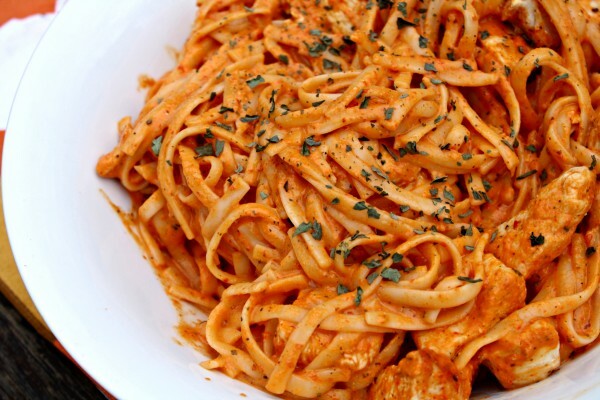 Saute chicken, stirring often, until chicken is cooked thoroughly. I used Chobani Greek yogurt 1) because they sent me a ton and I've been putting it in everything and 2) because after trying several different Greek yogurts over the years, I always gravitate back to Chobani. It's the creamiest and most delicious, in my opinion.